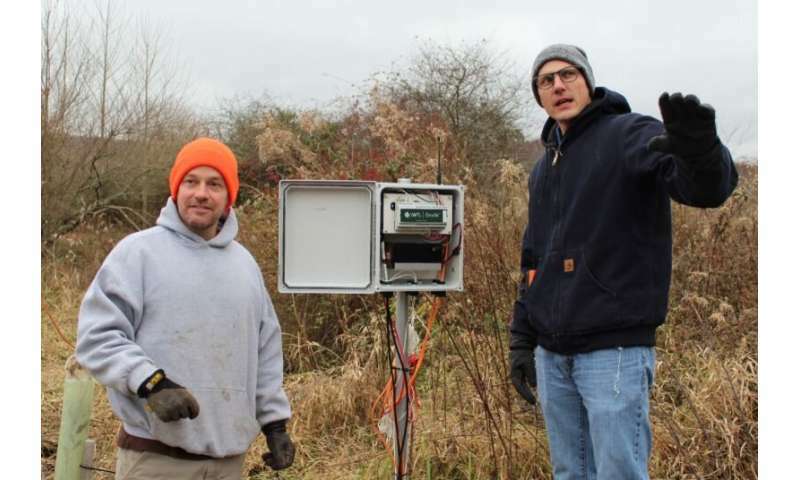 On the edge of Virginia Tech's campus, on a stretch of farmland that few students ever visit, small boxes are whirling through the season's change to winter, collecting and transmitting data that will make it easier for scientists to monitor and collect data across landscapes. This field test of an environmental sensing system is one step in a project between the College of Natural Resources and Environment; Innovative Wireless Technologies, a leading wireless mesh network company headquartered in Lynchburg, Virginia; and the U.S. Department of Energy's Pacific Northwest National Laboratory. The project was funded by a Department of Energy Small Business Innovation Research grant intended to refine, develop, and advance new technologies. "The call for this grant was focused on below-ground environmental monitoring and the development of new sensor networks and communication platforms," explained Daniel McLaughlin, assistant professor in the Department of Forest Resources and Environmental Conservation and Virginia Tech's lead investigator on the project. "The primary goal is to advance the ways in which we can monitor the fate and transport of certain environmental constituents and contaminants." The integrated environmental quality sensing system, called Envōk, is a user-deployed network composed of wireless microprocessing nodes that are capable of connecting to a wide range of environmental sensors. A grid of these nodes communicates through a wireless gateway to a server that allows operators to control the sensors remotely. The testing of this system is taking part along Stroubles Creek on land dedicated to the Department of Biological Systems Engineering's StREAM Lab. In addition to McLaughlin, Associate Professor Kevin McGuire and Associate Professor Brian Strahm, both of the Department of Forest Resources and Environmental Conservation, and Assistant Professor Ryan Stewart of the College of Agriculture and Life Sciences' School of Plant and Environmental Sciences are participating in the project. Matthew Fisher, the principal investigator for Innovative Wireless Technologies, described the site as an ideal location to test the system's capacities. "We have a first version of our finished product, and we wanted to evaluate that product in a field simulation," he said. "Virginia Tech is providing that evaluation. They are taking the system and, with support from us, they are going to evaluate it and see if it meets the criteria that we set for the project." For Virginia Tech researchers, the testing and evaluation of the Envōk system has run the gamut from small software preferences to broad considerations of sensing capacities and monitoring structures. "We're assessing and tailoring the system to meet user needs, ranging from software design and installation options to what kind of outputs and sensors are most useful in field applications," McLaughlin said. "We've looked into what kind of triggers and communication abilities should exist and what kind of memory and battery configuration the system should have." A crucial component to the system, beyond ease of installation and the accuracy and reliability of data monitoring, is allowing users to incorporate a wide range of sensors in one system. "There are a lot of sensors available now, and what's lagging behind is an easily deployable sensor network that would allow a team to use sensors from any vendor and for a wide range of parameters," McLaughlin explained. A further goal of the project is to design a system that allows users to "speak" to the monitoring network using mobile devices or personal computers and alter the data collected by sensors as conditions vary. "We're focusing on user-to-network communication but also communication among nodes, where measurements at one node location can trigger specified measurement protocols at distant nodes," McLaughlin said. "Let's say that one measurement location is in a stream, and some pre-defined condition like a rising water level is triggered. We'd like that node to have the capacity to tell nodes further along in the network to, for example, start recording data at a faster rate." On the Stroubles Creek site, sensors will measure water levels, soil dynamics, carbon fluxes, and stream conditions over the next three months. Virginia Tech researchers will be testing the hardware and durability of the system, the communication capabilities between nodes and to the server, and real-time adjustments to sensor measurements that would allow for adaptive modeling and data analysis. The next phase of the project, set to launch in spring 2019, will be a larger field test along the Columbia River in Washington state, where the Pacific Northwest National Laboratory will take the lead in verifying the Envōk product as it moves toward commercialization. "We'll be deploying a fully functioning system on the Hanford Site, a former nuclear production facility along the river, with five times the number of nodes and additional sensor technologies," Fisher said. "That will be the production evaluation period, the final test of the system before we begin production." The project has the potential to make the collection and processing of field data more dynamic and easier for scientists. "This project is not just about what we can measure but rather developing new ways to make and communicate those measurements," McLaughlin said. "Our goal is an easily deployable sensor network that is flexible and with communication capabilities for real-time measurements across parameters and over large study areas."